First came the merger. Now comes the lawsuit. Two months after the cable company Charter combined with Time Warner Cable, one of the country's biggest channel operators, Univision, is suing Charter for breach of contract. It is the latest tug of war between two sides of the television business -- the programmers like Univision that own channels and the distributors like Charter that deliver those channels to viewers. Both sides claim they're acting on behalf of viewers. Thanks to the merger with Time Warner Cable, Charter has a lot more customers and a lot more power. Before the deal closed in May, Charter served 4.3 million TV households. Now it serves more than 17 million. This means Charter has more muscle in its negotiations with programmers like Univision. But Univision has leverage, too -- it is the largest Spanish language broadcaster in the United States. Now they may duke it out in court. In the lawsuit, filed on Friday, Univision alleges that Charter is "flagrantly breaching Univision's contract with Charter by using the acquisition as a pretext to unilaterally impose license fees that are dramatically below current market license fees for Univision's valuable content." Charter's contract to carry Univision's channels expired on June 30. But Time Warner Cable's contract is in effect through 2022. 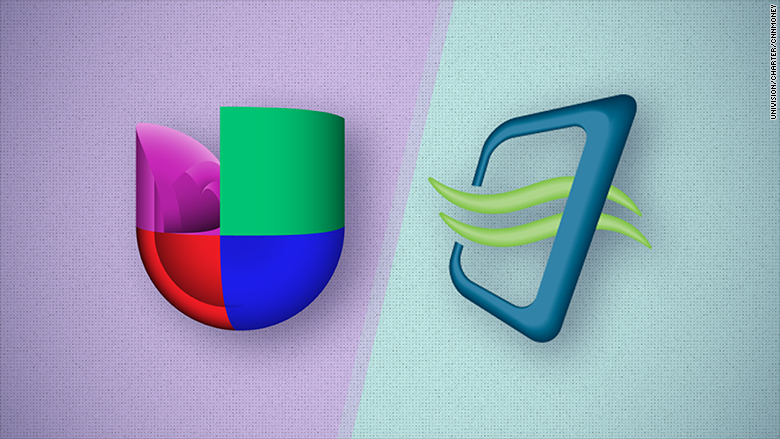 Time Warner Cable was paying a lot less on a per subscriber basis for Univision's channels, according to the lawsuit. The exact financial terms are not known. But Charter says the Time Warner Cable contract should remain in place now that the merger has taken effect. Indeed, one of the justifications for the merger was that the combined company would be better equipped to resist channel owners' demands for higher rates. Univision obviously disagrees. It wants to renegotiate with Charter and earn higher per-subscriber fees for its programming. These subscriber fees help channels produce more and more shows and parent companies to extract more and more profit. They also cause your cable bill to get more and more expensive. Private disputes between distributors and programmers are common, but breach of contract lawsuits are less common. Charter's only comment on Friday was, "We have a long-term contract with Univision and we expect them to honor it."